Laden has become more powerful and ferocious with every passing day. 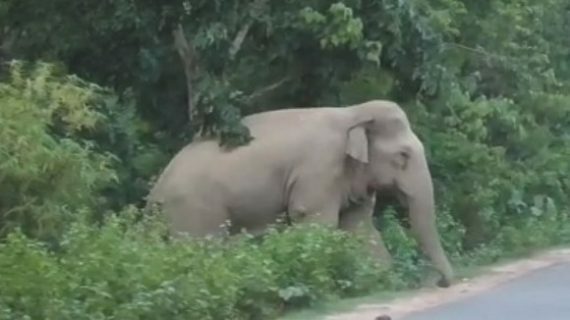 Laden, the jumbo that has been unleashing a reign of terror in Dhanubhanga area under Rongjuli forest reserve region of Goalpara district in Assam, now freely intrudes into human habitation even during daytime. Till the other day, laden was a nocturnal visitor by his love for jackfruit has made him more daring. With jackfruits now available across the villages in the region being it in season, Laden invades the backyards of the villagers to have his lunch of jackfruits. Laden has made his home in the region for quite some time now. On Saturday, Laden made his majestic appearance in the afternoon near the Deosila market of Dhanubhanga to feast on jackfruits sent shock waves among the locals who are now more terrorized that before. After feasting on jackfruits during daytime, Laden returned once night descended to unleash his destructive self. The unruly wild elephant ravaged a shop in the market area and nearby residence on Saturday night. Even school children in the region dread to go to schools as wild pachyderms freely move around during daytime in the region.